KUSURI WHEATGERM KOI FOOD MEDIUM PELLET. Formerly known as FPF - wheatgerm. Also available in Large Pellet. 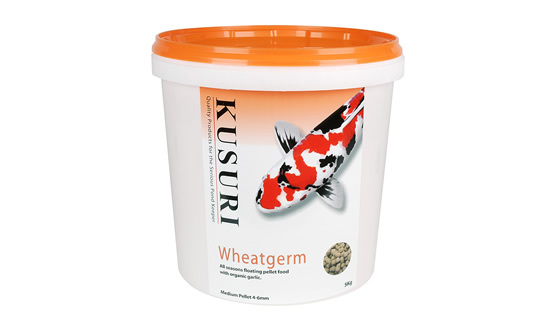 Kusuri WHEATGERM floating pellet food is a unique high quality pellet food formulated for Koi and all pond fish. An unsurpassed recipe, providing a a complete spectrum of beneficial ingredients for health and colour. Wheatgerm pellet food is suitable for use at all feeding temperatures. Also available - Kusuri Premium, Kusuri Multiseason, Kusuri Growth and Kusuri Supersilk 20.